136 Make your posset drink with white wine and when you eat any pottage put some of ye powder in it if you be sore pained and if you have ye stone it will come away in shivers and if it do so take this drink and it will leave no corruption in ye bladder. The Drink Take Rosemary and wild [etim?] 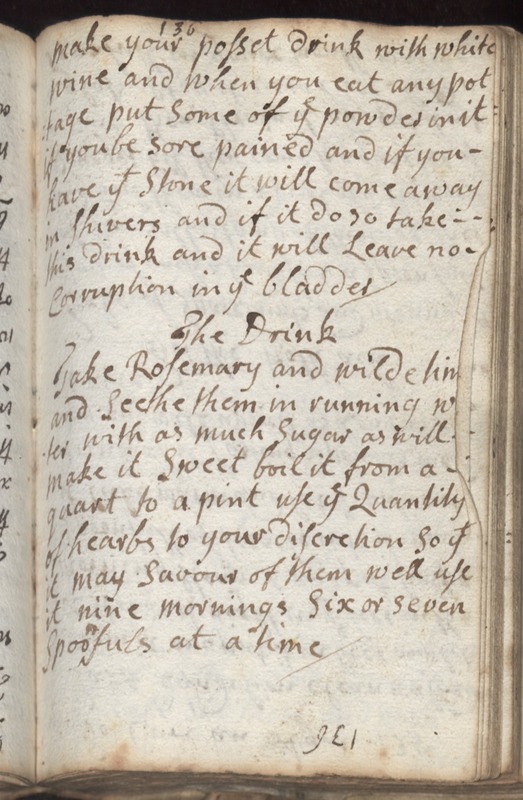 and seethe them in running water with as much sugar as will make it sweet boil it from a quart to a pint use ye quantity of gearbs to your discretion so yt it may savour of them well use it nine mornings six or seven spoonfuls at a time.